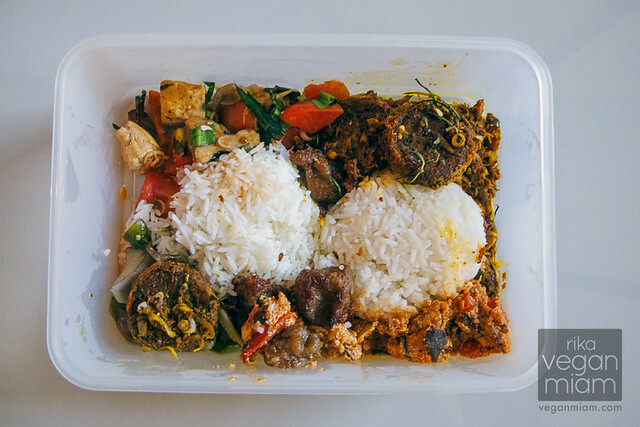 The smaller of the two had fewer options, mostly veggies, curries and mock meats. 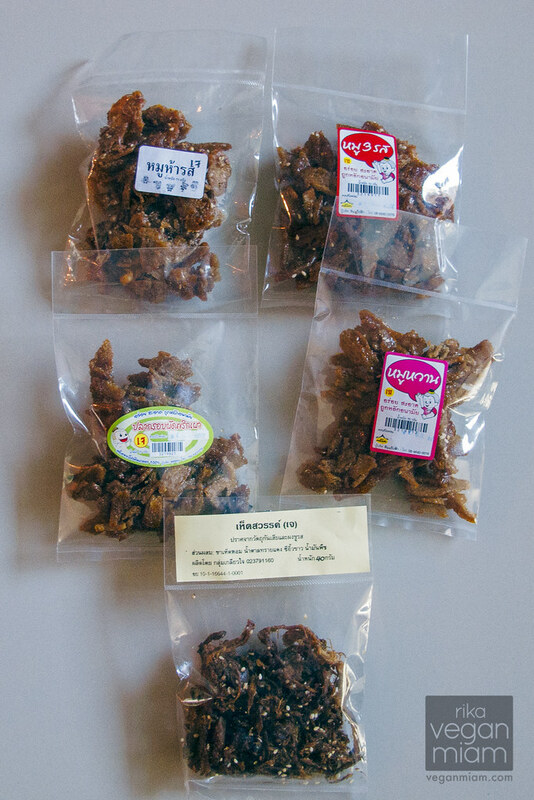 They also sell a tiny section of sweet and savory snacks – particularly dried fried mushrooms. The restaurant opens on weekday (not sure what time, but before 3pm) and closes on Sundays. Here is the accurate street view of the restaurant: http://goo.gl/maps/y9FaO (I had a hard time finding them via Happy Cow or online for their address). Youta Vegetarian: here’s what it looks like. 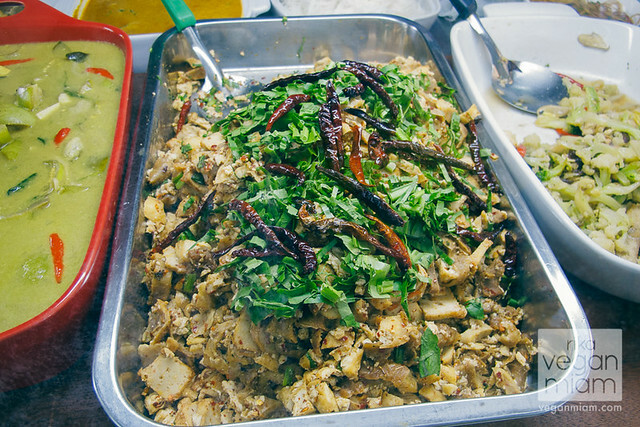 Youta Vegetarian: here’s what their buffet dishes look like. Priced per serving, includes rice. I prefer the other larger restaurant for more dish varieties, it’s really small there. 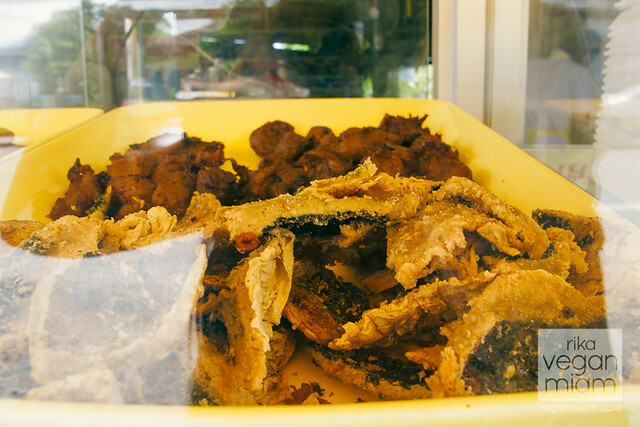 Youta Vegetarian: Sweet and/or savory dried & fried mushrooms, used as condiments on rice. They were too sweet for us. 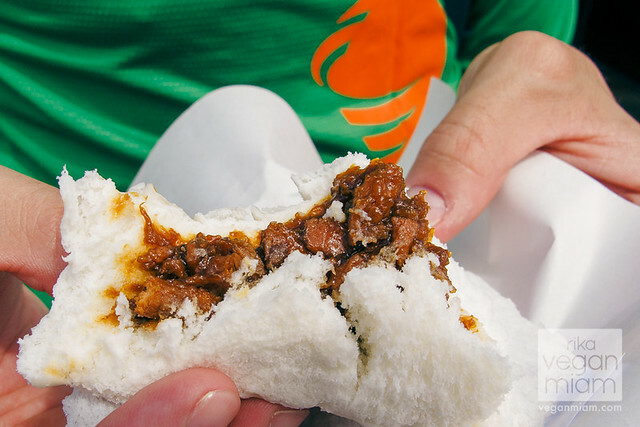 We prefer salty and savory condiments. 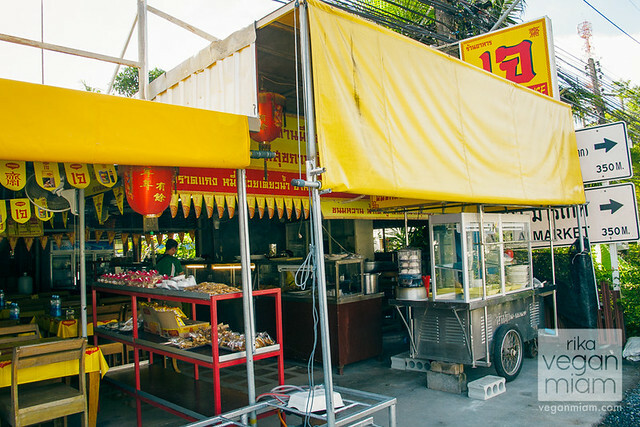 The larger of the two restaurants, the one we frequented most, was a short drive from where we were staying and had a selection of noodles, veggies, mock meats, fried goods, occasionally bao (miam!) and a large table of prepared desserts. Some of the dishes, in fact most of the faux meat dishes, were pretty spicy but the noodle dishes were pretty mild. The desserts were the only items with prices on them and the pricing of the hot dishes was always a bit tricky because it involved a system of price per dish and prices seemed to vary to a degree. Overall though, it was reasonably priced. Here is the accurate street view of the restaurant: http://goo.gl/maps/6zWNO (I had a hard time finding them via Happy Cow or online for their address). 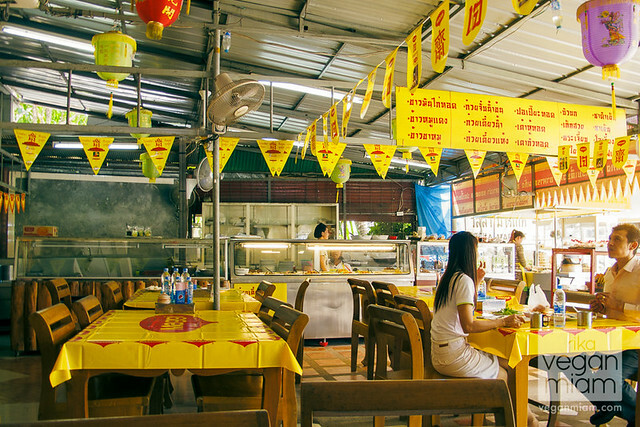 The restaurant is open from early morning (around sunrise) – 3pm on weekdays but it’s best to get there before noon depending on how much food is left. 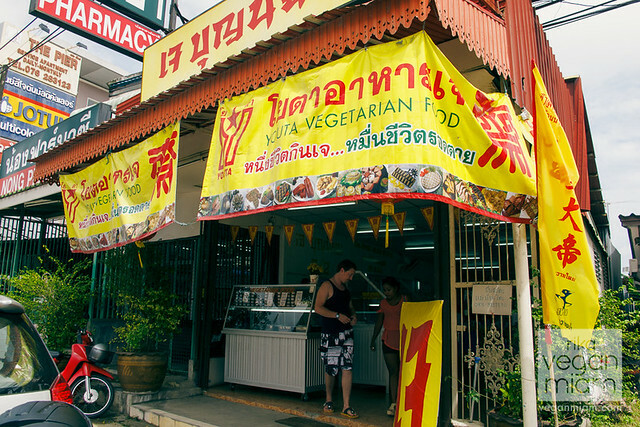 They are closed on Sundays, stay however open during the Phuket Vegetarian Festival. 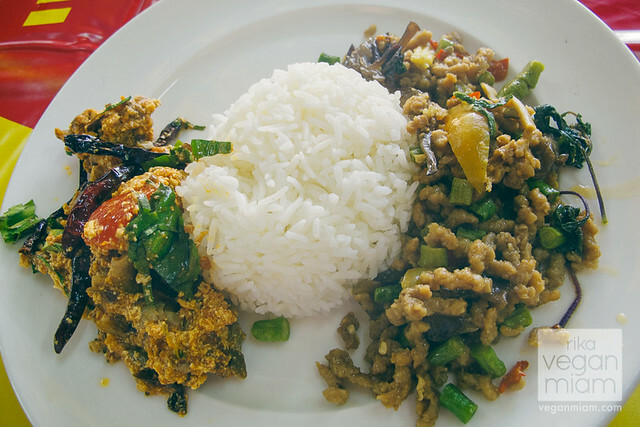 Vegetarian House: The Chalong Circle is just ahead. 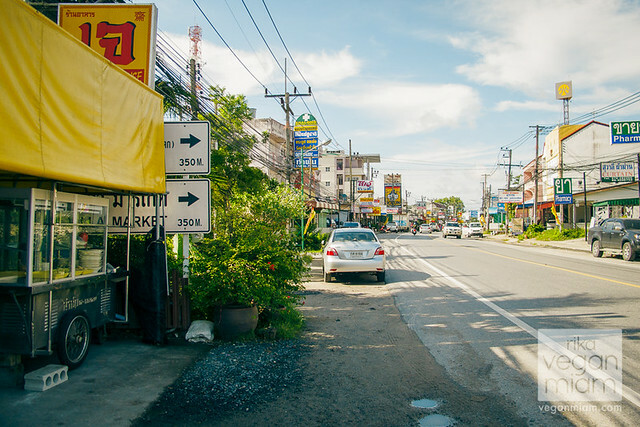 This is the Chao Fa East Road. 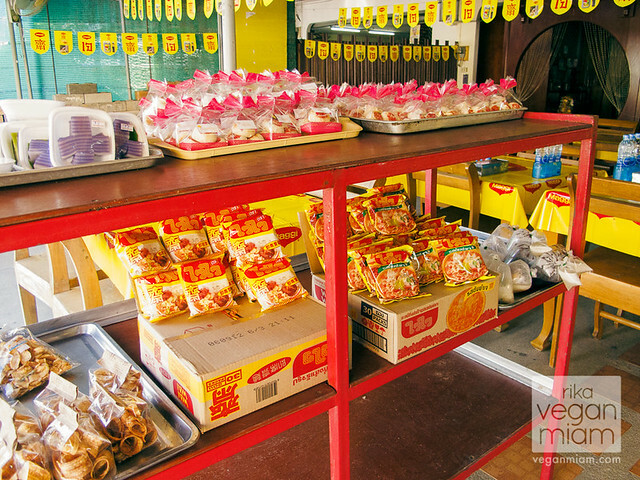 Vegetarian House: Entrance of the restaurant, you will see a red shelved cart filled with vegan sweets & savory snacks. 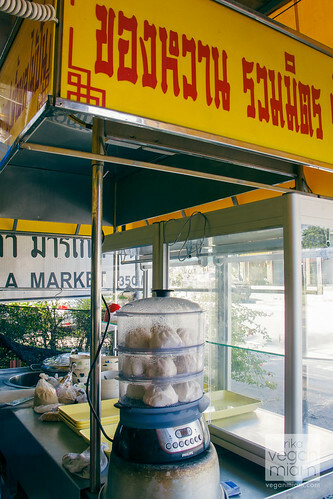 On the right, you will see a wheeled cart with steamed buns (bao). Vegetarian House: Doni at the Vegetarian House, looking at the dishes. 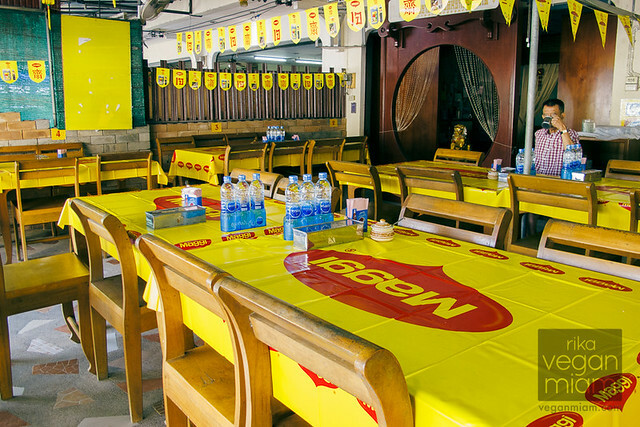 Vegetarian House: Adequate dining area, and the buffet area in the front. Bring a natural mosquito repellent (I use and prefer either Tick Tock or Beat It!). Vegetarian House: Dining area, and I got bit several times under the table by mosquitoes. Bring a sanitizer and of course, mosquito repellent (I use and prefer either Tick Tock or Beat It!). 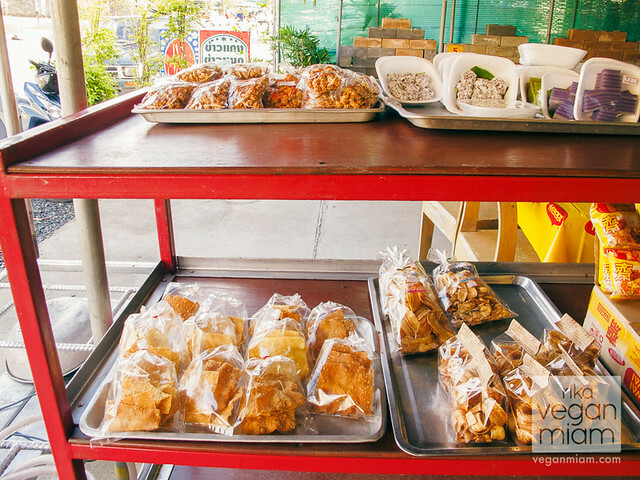 Vegetarian House: Plenty of sweet and savory snacks to bring back to your hotel, hostel or flat. 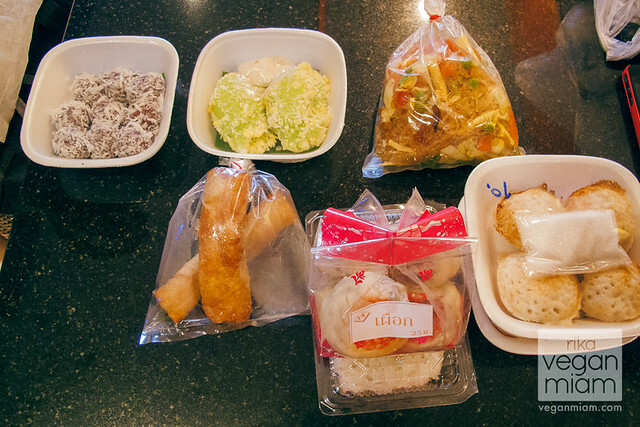 I can identify a few: on the top left is the sweet and salty cashews, and the top right is Thai sweets consisting of Khanom Thom ขนมต้ม (sweet nutty stuffed dessert balls with shredded coconut) and sticky rice cakes. 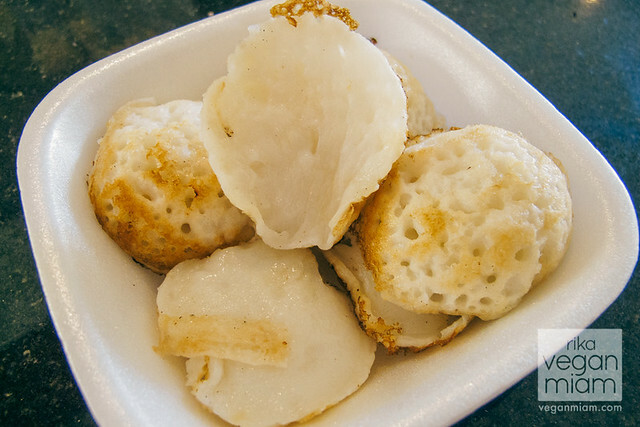 I’m not sure about the bottom – they appeared to be fried things. 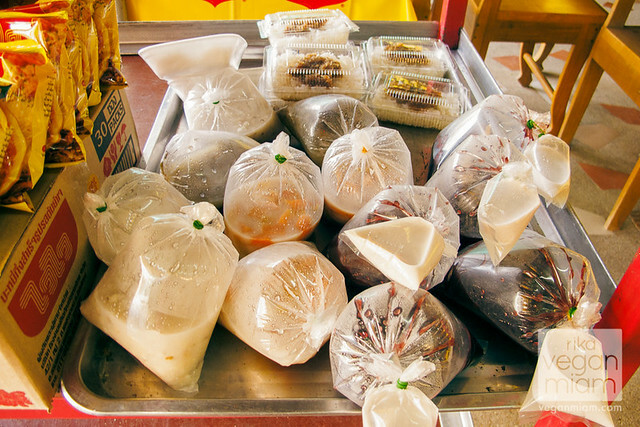 Vegetarian House: More Thai desserts-to-go such as the sticky rice dishes (black & white) with coconut or palm sugar, coconut-milk based soups with sago or sweet pumpkin [also known as Fak Thong Kaeng Buad (ฟักทองแกงบวด)], and so much more. 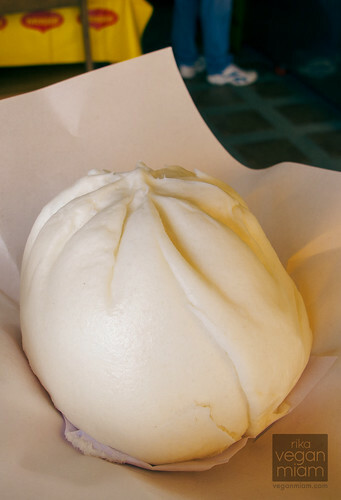 Vegetarian House: Freshly made vegan char-siu “pork” bao-zi (buns), they taste so good when eaten warm. Vegetarian House: Our first meal, the top left “curry” was pretty spicy (you can see the chili peppers) and the top right & bottom were mild as I remembered (mostly veggies & tofu). I wish I can identify the dishes (I don’t remember much), but it was taken last year in October 2012. 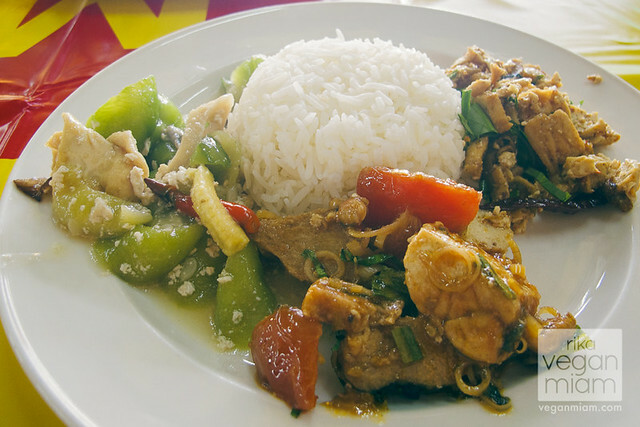 For approximately 50 THB (~$1.60), you get a choice of three items and a plate of white steamed rice. Brown rice is available for 10 THB. 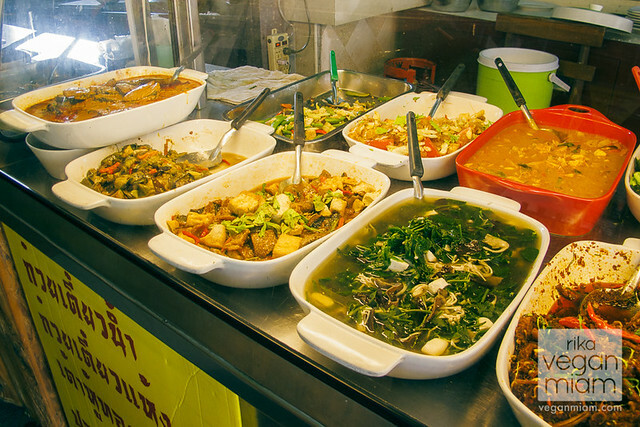 However, some dishes vary, so it might be less or more than 50 THB in total especially when you do a take-out, I would just say most are priced by dish. 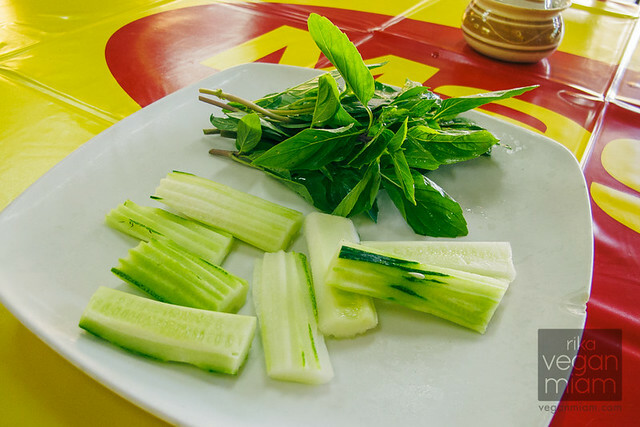 Vegetarian House: If you dine in, one of the staff will bring you a plate of freshly cut cucumbers & Thai basil (helps mellow down the heat from the food) and a complimentary glass of water. 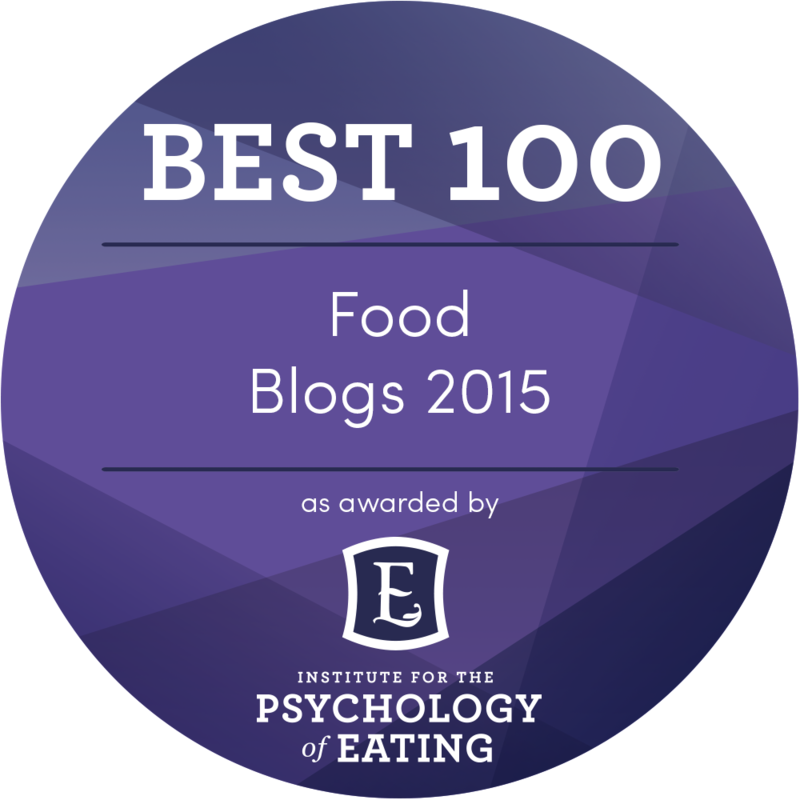 Vegetarian House: We brought some vegan goodies back with us! 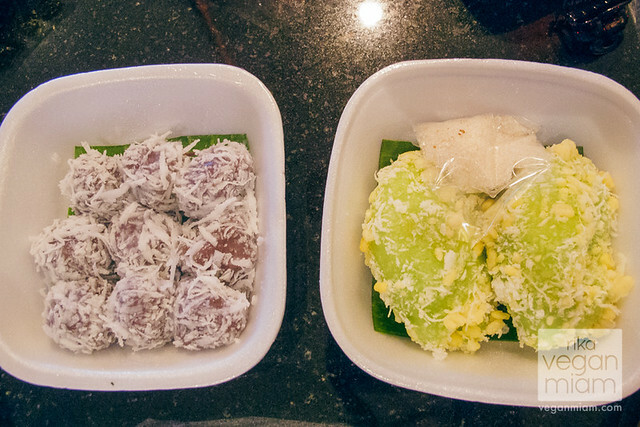 Vegetarian House: Vegan Khanom Thom ขนมต้ม (Sweet Nutty Filled Doughy Balls with Shredded Coconut) and Tua Pap ถั่วแปบ (Rice flour “Morsels” with peanuts, mung beans, sesame seeds and coconut). Both are so good! 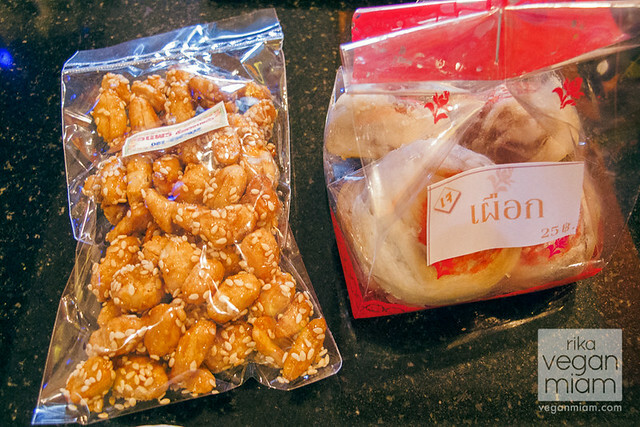 Vegetarian House: These are our favorite Thai desserts! 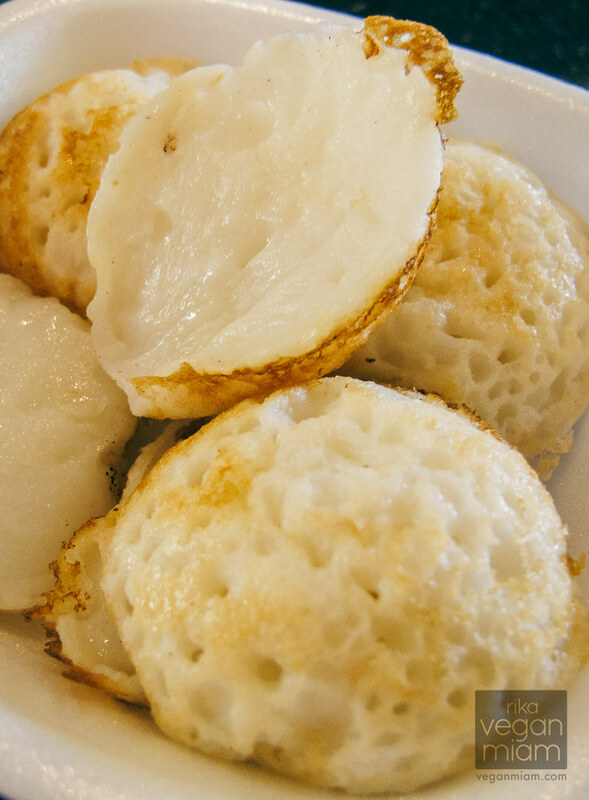 These are called, Kanom Krok ขนมครก (Thai Coconut-Rice Pancakes), which are soft coconut custard-filled rice flour cupcakes. 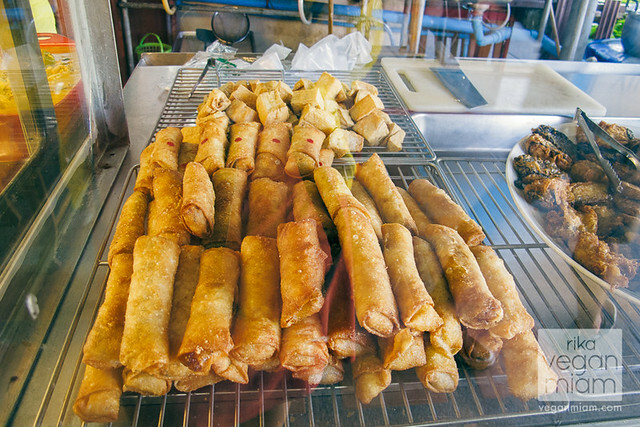 They are a yummy Thai street food indulgence! 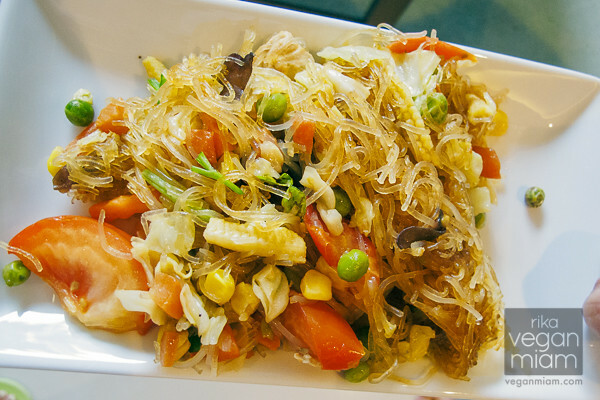 Vegetarian House: Vegan Ta Ko (ตะโก้) with sweet mung beans and served in pandanus leaves. 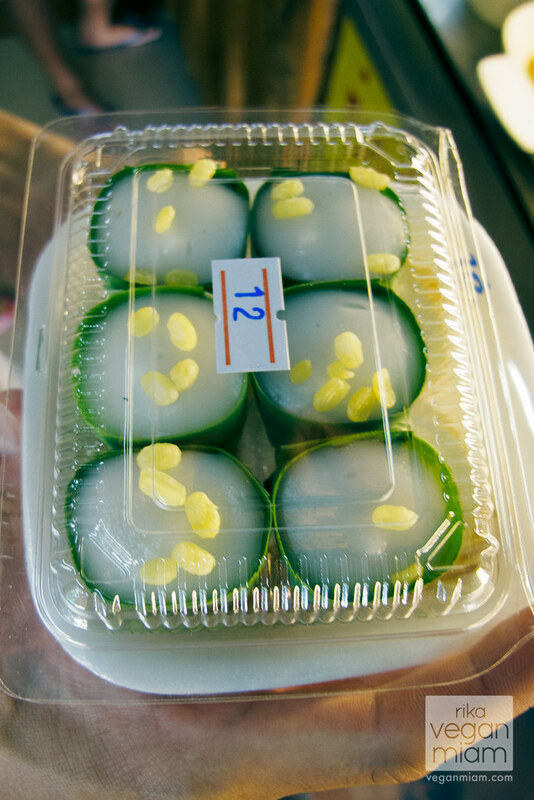 Ta Ko is a Thai Mung Bean pudding with coconut cream on the top and has 2 layers: a jelly custard on the bottom with coconut cream on top. 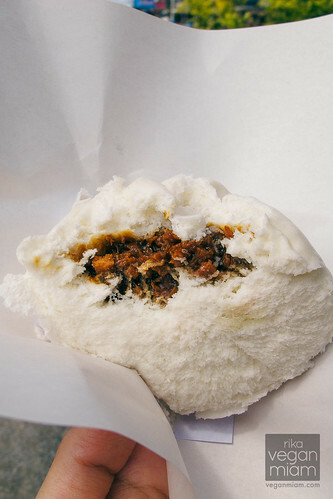 The pudding part is usually made of mung bean flour and water chestnuts. 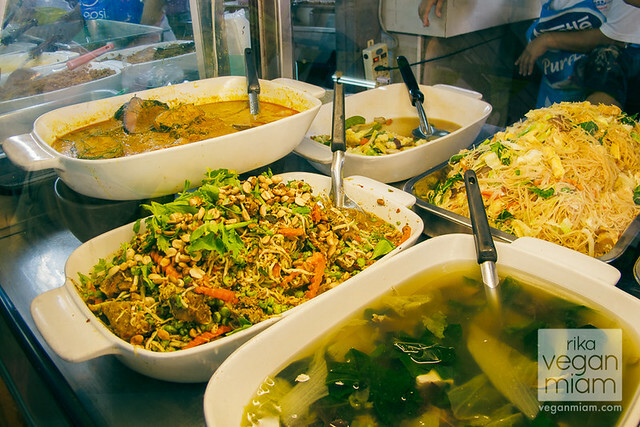 There are a lot of unlisted vegetarian restaurants across the island. 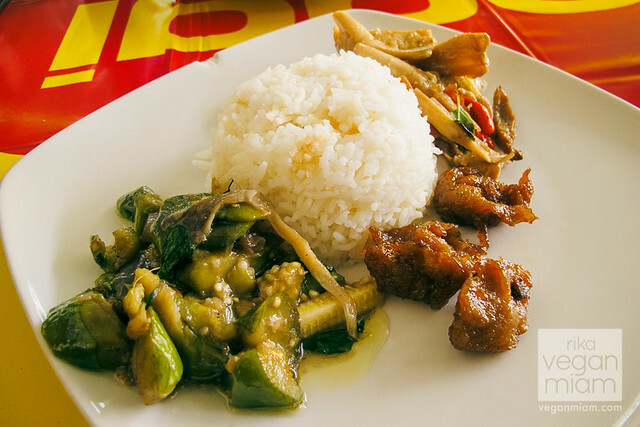 There is a vegan-friendly and raw-friendly “outdoor” eatery called SuperNatural which is at Friendship Beach Waterfront Resort. Your best bet in finding one is to look near one of the many wats, temples or shrines. Otherwise, keep an eye out for the word Jay เจ (read the post here for the meaning). 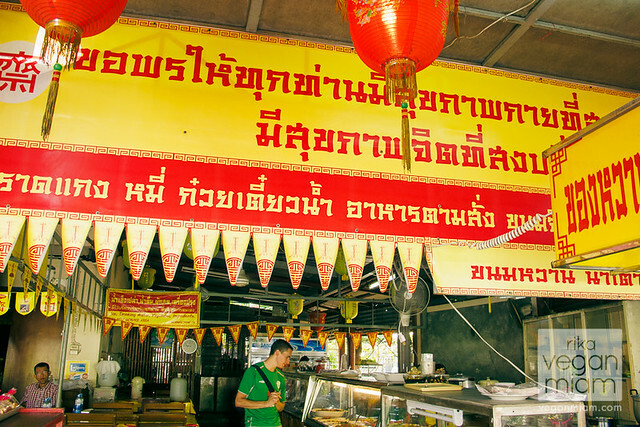 During the Vegetarian Festival, most of these permanent restaurants will have expanded hours and menus. What would you like to try from the post? 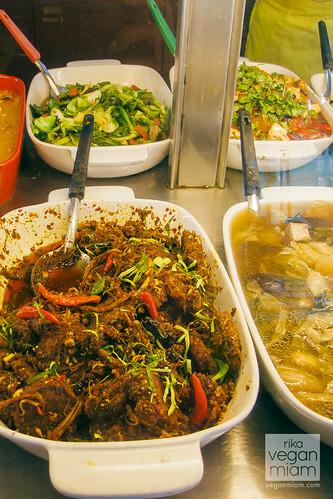 Have you been to buffets before? 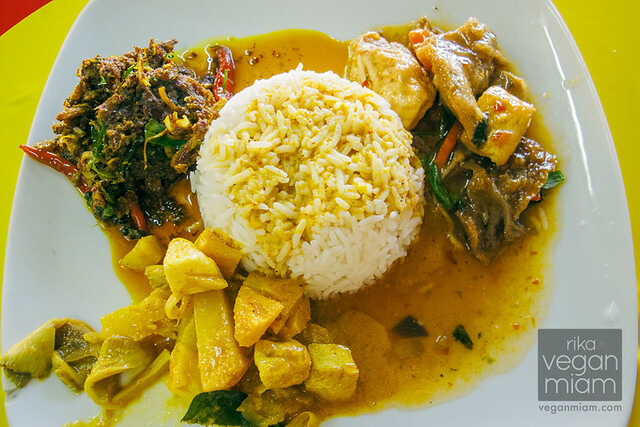 What is your favorite Thai curry dish?